Am I the only one who’s worried about the potential ‘weight’ involved in an overland lifestyle? I’m not talking about the ATM, GVM, GCVM or Tare of our rigs. I’m referring to the potential long-term physical effects of sitting in vehicles for extended periods, enjoying homemade pies in tiny town bakeries and giving in to the alluring draw of outback pubs when we’ve spent a long day on the road. ‘Back in the day’ I wouldn’t have been too concerned. I’ve been fortunate to maintain a high metabolic rate throughout my life. But that doesn’t just happen. And the older we get, the less we can take our physical well-being for granted. The trouble is that, when we spend extended time on the road, it can be difficult to establish a sensible exercise regime. Picture yourself camped in remote Australia. Your camp is the only speck of civilisation for hundreds of kilometres, there’s a single corrugated dirt track snaking across the surrounding expanse of mulga, and the sun’s starting to come up with the promise of another dry, hot day. While some people make a vocation out of challenging Mother Nature, I’m not one of them. To my eye, these are not the conditions that should see me strapping on a pair of running shoes and heading out for a jog. Besides, it’s a questionable idea to work up a sweat when our onboard water reserves don’t support a decent wash afterwards. While my husband’s sense of smell is poor because of a house fire in his university days, I reckon our littlest crew member would have some words to say if I started stinking out the rig’s cabin. A few months back, I received a pair of suspension trainers as a gift and they’ve quickly taken up residence in our camper. No, suspension training is not the practice of an apprentice mechanic fitting springs or shockies to a fourbie’s undercarriage. It actually involves the use of a simple pair of nylon training straps to perform a range of exercises. The straps are suspended from a solid anchor such as a tree limb, a vehicle’s roof rack or a closed door. From there, the user’s body weight is applied to engage a range of muscle groups through a series of exercise sets. This type of training owes its origin to a US Navy SEAL on deployment in the late 90s who used his martial arts belt and some parachute webbing to rig up a makeshift workout station. The context was the need to maintain fitness while remaining within the confines of a military base. Since the straps were commercialised a couple of years later, they’ve developed an international following, including among niche fitness circles. But there’s no need to be deployed on combat operations – or to have joined the ranks of lycra-clad wannabes – to enjoy the benefits. 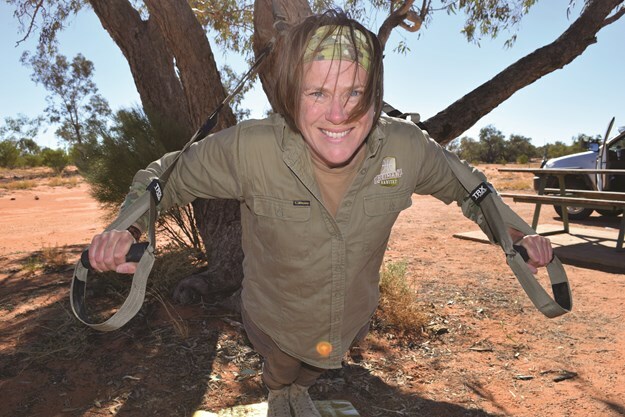 Combined with an exercise mat to protect from burrs and bindis when I’m out among the rough stuff, these simple straps provide a range of options for working out without venturing away from camp. Now, I’m not saying that I’ve found the perfect solution. Obviously I still need to watch what I eat on the road and keep on my feet wherever possible. But the key benefit here is that I’ve found something that works for me that can be used virtually anywhere, so I can establish an exercise regime – and stick to it – no matter where we are and how long we’re on the road. If the opportunity also comes up to do some bushwalking along the way, then that’s great. I’m simply not dependent on it when I’m using the suspension trainers. And when these opportunities do arise, I can take the time to pause, reflect and listen to the sounds of nature rather than being concerned about whether I’ve achieved a self-imposed benchmark for physical exertion. Importantly, I can focus on ensuring that my seven year old daughter is enjoying the experience as much as I am. Helping her to develop a sense of reverence for her environment and enjoyment of the outdoors will support positive habits of incidental exercise that I hope will last a lifetime. And that’s far more important to me than pursuit of any individual fitness goals. Finding a pattern of physical activity that works is a very personal concern. Whether your travel habits support a regular brisk morning walk or you prefer yoga sun salutations while you’re on the road, there are few better ways to start the day than quality exercise.